Brush chicken evenly with 1 Tbsp. dressing. Refrigerate 30 min. Meanwhile, cook quinoa as directed on package, omitting salt. Cool to room temperature. Heat greased barbecue on medium-high heat. Place corn in small disposable foil pan sprayed with cooking spray. Grill chicken and corn 12 to 14 min. or until chicken is done (170ºF) and corn is tender and lightly charred, turning chicken after 7 min. and stirring corn occasionally. 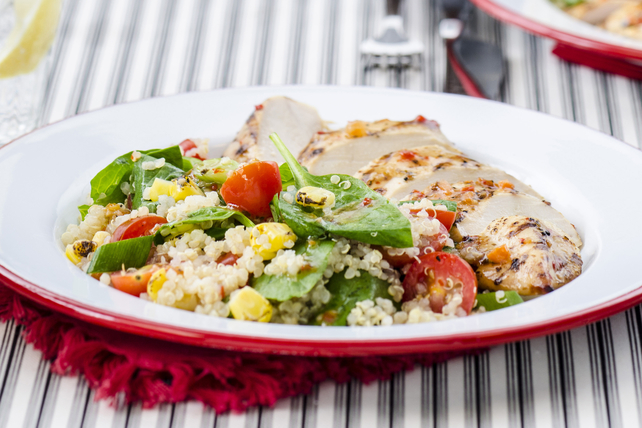 Combine quinoa, spinach, tomatoes, onions, basil, corn and remaining dressing. Serve with chicken. Slice the chicken. Serve with the salad. Prepare using Kraft Calorie-Wise Sun-dried Tomato & Oregano Dressing or Kraft Calorie-Wise Zesty Italian Dressing. Stack 2 (12x10-inch) sheets of foil. Fold over all sides, then press to form rim. Spray lightly with cooking spray, then use to grill corn as directed. This colourful salad, made with better-for-you products, can be part of a healthful eating plan. And as a bonus, the spinach provides an excellent source of vitamin A.